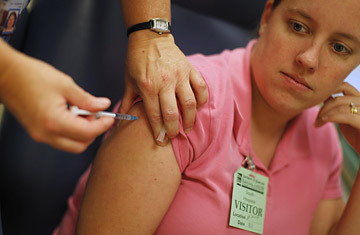 Bridget Roberts of Columbia, Maryland, receives an experimental vaccine designed to prevent her from contracting the H1N1 swine flu virus at the University of Maryland in Baltimore. Public health officials have been warning for some time that nothing about the flu is predictable. But here's something that is: When it comes to a new strain of the flu like H1N1, which has already stoked global fears of a massive pandemic, there's almost certain to be some overreaction. That's what happened this week when the public was hit with a double-play of scary news: A new estimate showed that that up to 90,000 Americans could die of H1N1 in the upcoming season; and a simultaneous report that the government was taking some unprecedented steps to get a vaccine ready in time. But the fatality numbers are more complicated  and less alarming  than they seem; and the vaccine report is less a reason for alarm than a sign of smart epidemiological planning. What sparked the reports about insufficient testing of the new vaccine was a statement by Dr. Thomas Frieden, director of the Centers for Disease Control, confirming that the government has given flu vaccine manufacturers a green light to begin bottling up still-experimental shots and readying them for shipment, even before the final results from the ongoing tests on the vaccine's safety and effectiveness are completed. It's an unusual step, but one that was also recommended by the President's Council of Advisers on Science and Technology (PCAST) in a report released the same day. By initiating the so-called "fill and finish" step of vaccine production, manufacturers can be prepared to ship vials as quickly as possible in mid-October, once testing confirms that the shots are safe and effective at producing immunity against H1N1. "The recommendation was to proceed with filling and finishing even before dosage information is available," said Frieden. "That step has been taken." That doesn't mean, however, that anyone will get an unproven vaccine. The vials will stay right where they are until the testing is completed--and for now, those trials are going well. Secretary of Health and Human Services Kathleen Sebelius, also speaking at the workshop, noted that "So far there are no red flags. I think we are on target for mid-October to have the vaccine coming off the production lines." The reason for the wait is biological. The first volunteers to test the new vaccine were inoculated in August, and because most people will not have any existing immunity to H1N1, it will require two shots, spaced three weeks apart, to educate the immune system to recognize H1N1, and another six to eight weeks after that to generate true immunity to the virus. That's when scientists will know if the vaccine provided enough protection to allow the bottled inoculations to be shipped. After decades of making flu vaccines, the scientists are sure they know what they're doing. Indeed, had the pandemic begun earlier, in December or even Januarywhen the World Health Organization made its determination of which flu strains to include in the routine seasonal flu vaccineinstead of April, then H1N1 might have simply been included as part of the 2009 shots. Still, the decision to approve the fill and finish steps underscores how unusual H1N1 is, and highlights the fact that the upcoming flu season may yet hold surprises. In its report, PCAST also released projections of how severe the pandemic could get: up to 120 million people coughing, sneezing, feverish and otherwise sick with the symptoms of flu, 90,000 people potentially dead from the illness, and half to 100% of beds in intensive care units of hospitals in hard-hit regions filled with flu patients. But even those alarming numbers require some perspective. The figures, says PCAST member Dr. Harold Varmus, president of Memorial Sloan Kettering Cancer Center in New York and former director of the National Institutes of Health, were generated using data from previous flu pandemics--from 1918, 1957 and 1968--along with the latest data from last spring's outbreaks of H1N1 around the world. Those stats, say officials at the Centers for Disease Control, were then run through models used in the government's 2005 pandemic preparedness efforts that began in the wake of bird flu cases of H5N1 that arose in Asia. That's a lot of moving statistical parts, and when it comes to an ongoing pandemic such as the current one with H1N1, it's especially difficult to get reliable data on how many people are infected, how effectively the virus is moving from person to person, and how much disease it can cause. Death rates from H1N1 are particularly challenging, since making reliable projections requires comparing the total number of people infected with H1N1, as confirmed by a lab test, to those who have died from the disease. At the moment, officials don't know how many people have actually been infected with the virus; they can only count people who are sick enough to see a doctor or come to a hospital. For every person who shows up in a hospital, however, there are likely hundreds or thousands more infected with H1N1 who never see a health care professional, because they don't get very ill. That means there's a lot of educated guesswork at play. By no measure, however, were the new numbers reassuringand that was the point. While the report's authors, which include some of the country's sharpest minds from science, medicine and engineering, stress that the forecast is not predictive of what could actually occur in coming months, it was intended to remind everyone how devastating a flu pandemic can be. "There are some people taking the figures too literally," says Varmus. "But it's a wake-up call. The public wants to be aware that while these numbers are not predictive, they are certainly well within the realm of possibility." Such predictions are also a way for public health officials to get a handle on how infectious a new influenza like H1N1 might be, how it spreads, and how quickly. That helps them know how much vaccine might be needed, how to distribute it, and when to expect a surge in demand for flu treatments, including antiviral drugs such as Tamiflu and Relenza. It can also help predict when hospitals might become overwhelmed by flu cases, and prepare them to patch up already strained health care resources. "We can't yet predict what proportion of the population will be infected," says Varmus. "But it is very likely that something upward of 50% will be affected. All of us have a responsibility to blunt the epidemic by decreasing the spread of virus. If people understand that they can mitigate the epidemic by washing their hands and staying home when they are sick, it means the peak of disease will occur later, when there is more vaccine available." That could also help to keep the impact of H1N1on the health care system, on families and on the economy in the form of fewer sick daysto a minimum.